The Wildfire Project’s Dr. Paul Hessburg discusses the Era of Megafires at a work session of the Senate Natural Resources and Parks Committee. This is the busiest week of the legislative session so far. Policy committees in the Senate and House have until the end of Friday to act on legislation. Some are having longer or extra meetings to accommodate voting on bills. At the same time, the Senate is planning another round of votes on bills that have already cleared the committee hurdles. Senate Bill 5270, which I introduced to make the Department of Natural Resources’ contract-harvesting program permanent, is among those on the voting calendar. During my weekly interview with KOHO radio yesterday I provided an update on each of my prime-sponsored bills. If you were unable to tune in I encourage you to click here for the discussion. My fellow legislators were very sympathetic when they heard about the devastating wildfires that struck our area in 2014 and 2015. But being in other parts of the state, they could not be involved in the community conversations that resulted from these latest fires – so local experts are helping me to bring the conversation to the Capitol. The multi-media “Era of Megafires” presentation blends natural history, expert perspectives, statistics and common sense to suggest an alternative to the suppression-based wildfire-management approach established in our state more than a century ago. The leaders of the Wenatchee-based Wildfire Project who are behind the presentation accepted my invitation to share their work with our Senate Natural Resources and Parks Committee during a meeting this past week. Judging from the thoughtful questions my fellow committee members asked afterward and feedback I’ve received, the “Era of Megafires” succeeded in putting the wildfire issue in perspective for them as it has so many others. I am grateful to Dr. Paul Hessburg, Sara Rolfs and Jeff Ostenson for braving the challenging travel conditions to share their good work with us. The “Era of Megafires” work session this past week preceded the committee hearing on the bill it helped to inspire. My measure, Senate Bill 5546, would have DNR begin assessing the health of state-owned forests and come up with a 16-year treatment plan that could include prescribed fire and thinning. The chair of our natural resources committee could not attend, so as vice chair I was in the position of conducting the hearing. After I explained the reasoning behind SB 5546, DNR leaders came forward to offer comments and state their strong support for the bill. Representatives of The Nature Conservancy of Washington, Conservation Northwest, the American Forest Research Council, the Yakama Nation, and the Washington Forest Protection Association also testified in support..
Because many committees meet at the same time, people cannot always be present to testify in person. We account for this by allowing the public to simply sign in as being for or against legislation. Representatives from Audubon Washington, Backcountry Horsemen of Washington, Washington Farm Bureau and Washington Farm Forestry Association, Vaagen Brothers and Boise Cascade all signed in as “pro” on SB 5546. The natural resources committee approved the bill unanimously yesterday afternoon. It has now gone to the Senate Ways and Means Committee (the budget committee) and will be scheduled for a public hearing there. I am encouraged by the support and thankful to the many stakeholders who have helped with this bill this session. 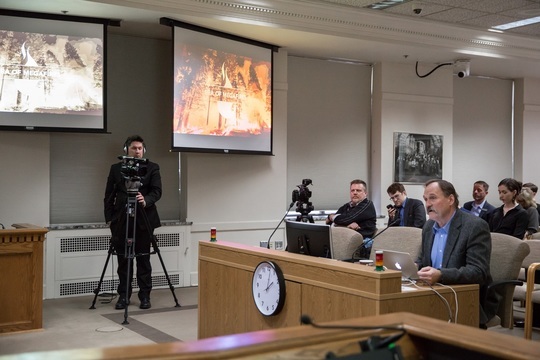 Click here to view TVW’s coverage of the Era of Megafires work session. Click here for another video that offers a closer view of the work session. Click here to view the hearing on my forest health bill – Senate Bill 5546.